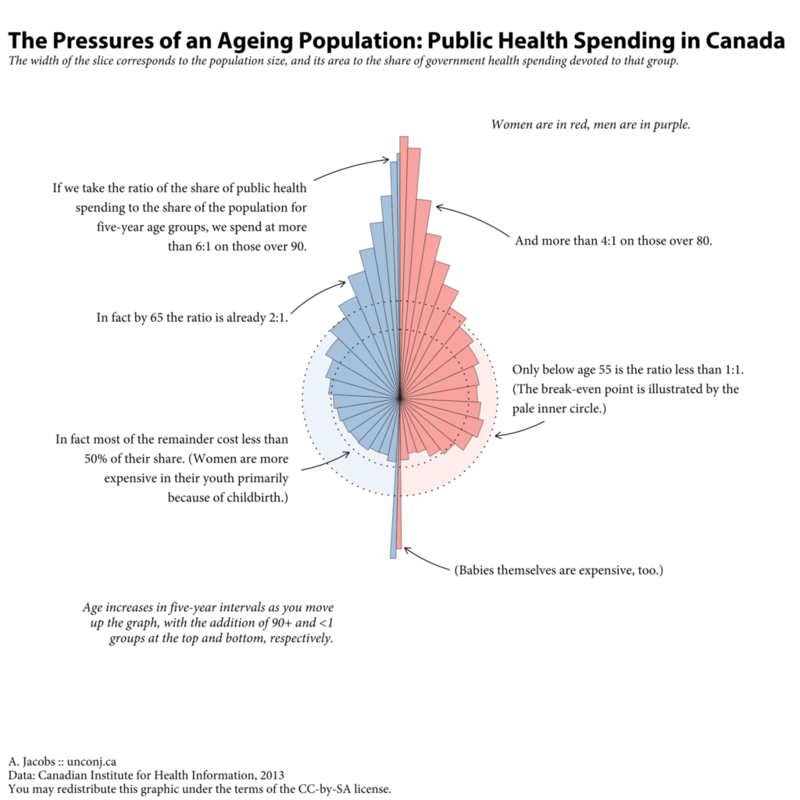 One of the looming issues in Canadian public policy is how to address the fact that our population is ageing, and that this will mean a larger burden on many of the social services that are more heavily consumed by those who are older. 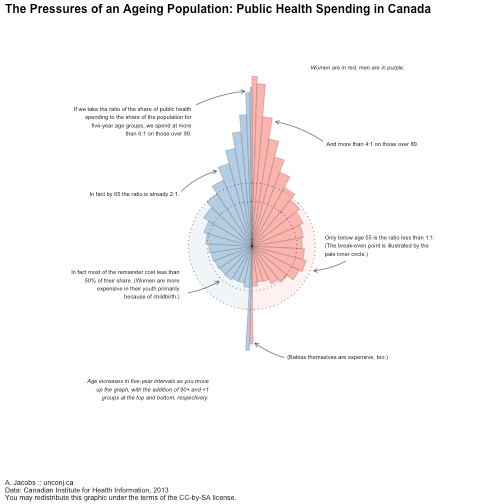 But just how uneven is the consumption of health services? The above should give you some idea of why this is viewed as a looming problem. 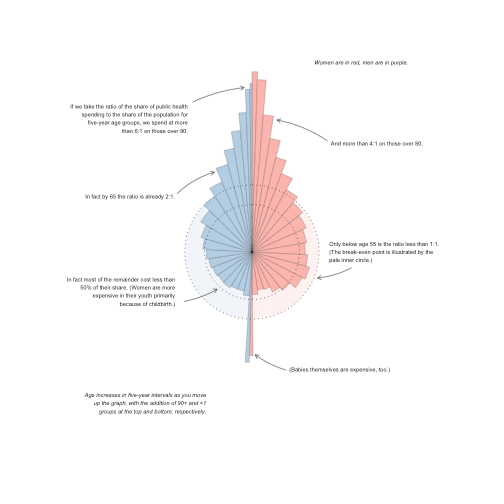 The remainder of this post is a technical discussion of how I created the visualization. I’m not quite satisfied with the overall approach (I think it takes quite a while before you can really read the graphic), but it does serve as a good technical demonstration of what can be accomplished in R.
A spie chart is really just a way of comparing two pie charts. The width of each slice corresponds to its share by one measure, and its area (or, in some formulations, its height, corresponds to its share by another). 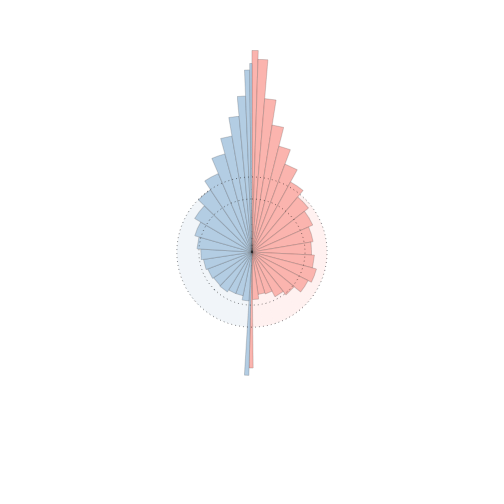 I originally found the concept while exploring DataVis. A version of the the paper that introduced the concept is available here. The first thing to do is reorganize the data. 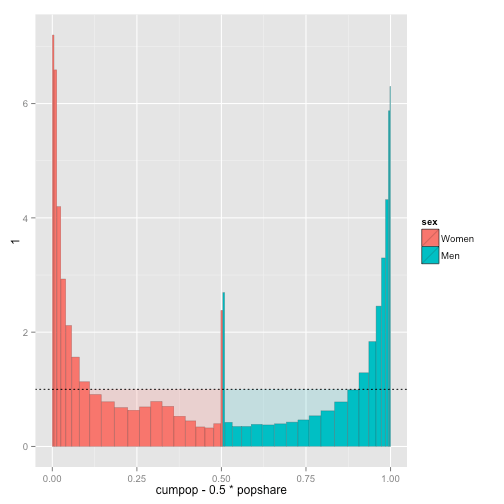 We want the data for women to run in the reverse order, so that Women <1 are next to Men <1. This is purely an aesthetic consideration; you can experiment with the spie chart that is produced when skipping this step. This really illustrates how a spie chart is constructed. The dotted line is the “break-even” point: below it, the expenditure of those groups is less than their share of the population, and above it those groups are consuming a share larger than their representation in the population. Note also that their are in fact two bar charts here, a pale one where all bars of of height 1 and a solid one over top. To transform this into a spie chart we need to make two adjustments. The first is the conversion to polar coordinates (imagine taking each end of the x-axis and squeezing it to a point), and the second is to rescale the y-axis so that the area (and not the height) of the slices corresponds to the relative shares of the groups. Fortunately, this second step is also quite simple: it boils down to taking the square root of each y entry. And with the addition of the labels we’ve created a simple spie chart. Of course it is quite ugly — there are far too many labels for the groups — but this is the starting point. Moving away from a statistical graphic to a pretty infographic, or [information visualization](), requires some modifications to the plot. Traditionally, the advice was to export this from R and into Inkscape or some other drawing program in order to add annotations, nicer titles, and so on. 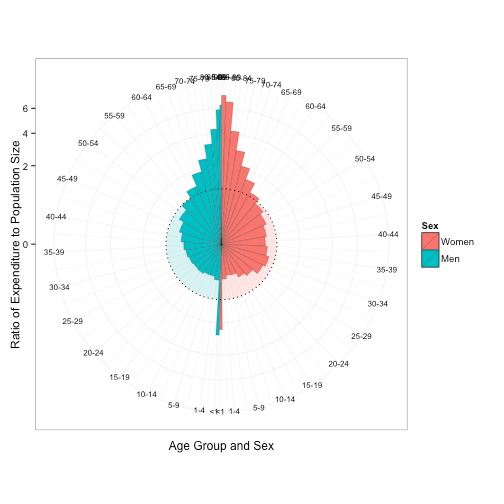 But if you’re like me, and enjoy the idea of creating visualizations purely programmatically, then there are ways to accomplish this tidying up in R alone. The nature of working with the PNG drivers when producing images is that you are severely limited by the selection of fonts available. One clever way of alleviating this is provided by the showtext and sysfonts packages, which simply draw text objects as polygons and lines instead of text — and thus avoid the font problem. I have not yet got showtext working with knitr, so the following standalone code is used to produce the image at the top of this post. Since the scaling is a little different, I’ve had to tweak the final object slightly. I’ve also added a subtitle. It’s true that Minion and Myriad are a little cliché, but they seemed like the most obvious choices to start with.